Last edited by Chizh; 04-14-2017 at 02:35 PM. Life in civil aviation is far removed from dangers of military conflict. Instead, it’s based on strict time tables and lunch breaks. Meet a group of old friends: captain Jury Maksimovich Protasov and his Mi-8MTV2 crew. After the events of the "Spring Tension" conflict, they are again in business together. However, this time they are gainfully employed as cargo transportation contractors, serving the interests of the oil industry. Rather than combat, this campaign will test your knowledge of the Mi-8MTV2 navigation suite in order to locate oil derricks scattered over the forests. Challenge yourself as a cargo pilot and never have to worry about being shot at again! The DCS: Mi-8MTV2 Magnificent Eight is required to be installed and activated as part of DCS World 1.5 for the campaign. To support the release of the Mi-8MTV2: Oilfield Campaign, we are also updating version 1.5.6 of DCS World. You can read the complete changelog here. Purchase them in the special section of DCS e-shop. Pre-purchase the DCS: Normandy 1944 Map and get the World War II Assets Pack in the DCS e-shop. Honoring our commitment to the DCS: World War II Kickstarter backers that contributed $140.00 or more, we are happy to provide these backers an Alpha look at the DCS: Normandy 1944 Map! The Alpha is a fully, separate build that will function only until the Normandy Map is available for download as an Early Access to all. Once the Early Access version is released, backers will be provided new keys, and the map will be integrated into DCS World 2.1. As an Alpha release, please understand that the map is still under construction and performance optimization is on-going. We do though look forward to your feedback to make the map the best it can be. To gain access, please first generate a key from within WWII Backer Rewards section of our website. The build is available by link “Download web installer” on the same page. Then, use this key when prompted the first time you play the Normandy map. You should then be happily flying over the skies of Normandy! We sincerely hope you enjoy this early look at the Normandy map. For everyone else, we are still on track to release the Normandy map to as an Early Access module by late-May 2017. Starting today at 1700 GMT and lasting until 8 May at 1700 GMT, we are running a 40% off sale on all DCS modules on Steam! In May of 1945 the Second World War came to end in Europe. This is celebrated in Russia as Victory Day on 9 May and in Western Europe and the US on 8 May as Victory in Europe (VE) Day. To commemorate the end of World War II in Europe, we are having a Bonus action. Use your bonus points to discount for many DCS modules (which participating in the bonus program) up to 60%! This bonus action will start on Friday, 05 May at 1500 GMT and last until Monday, 15 May at 0900 GMT. Since the Alpha release of the Normandy 1944 Map to high-level Kickstarter backers and selected press, we been listening to the feedback and are very pleased with the excellent reception! We are reading all the feedback, and it will help make the product even better at early access release later this month. There are only a few weeks left to take advantage of the 20% off discount price for this new map. Note that Normandy 1944 Map bundle includes the World War II assets pack for free! We are pleased to announce that RAZBAM M-2000C is now available for purchase on Steam! Please note that the DCS: M-2000C, and all future DCS World DLC releases on Steam, will now use Steam Keys instead of Starforce keys. As such, these purchases cannot be activated on the DCS World e-Shop version. Previous purchases will not be affected. Ends soon on Monday, 15 May at 0900 GMT. With the release of the Normandy 1944 Map fast approaching, we want to give our customers the chance to win a free key! On our Facebook page, we have started a lottery post. To enter yourself in the running, just share the post to your Facebook page and you will automatically be entered in the drawing. A week later, we will randomly select three winners. In addition to new ground, air defense, and ship units, the assets pack will also include numerous types and sub-types of obstacles. These range from landing beach objects to re-create the D-Day landing beaches to various types of tank and infantry barriers to be used further inland. All of these are available in the Mission Editor. Here are three images that display what is possible. Last edited by Mode; 05-12-2017 at 03:00 PM. With the release of the Normandy 1944 Map fast approaching, we want to give our customers the chance to win a free key! To enter yourself in the running, just share the Normandy 1944 Map Lottery post to your Facebook page and you will automatically be entered in the drawing. A week later, we will randomly select three winners. The DCS: Normandy 1944 Map is centered on the World War II battlefield of Normandy, France and is specifically created to depict the period after the D-Day landings and the establishment of several allied airfields in Normandy to support the beachhead breakout in late June 1944. The map measures 267 x 348 kilometers and includes airfields in both Normandy and southern England. The map includes the famous D-Day landing beaches and the "Atlantic Wall", rolling bocage fields of Normandy, large cities like Caen and Rouen, ports of Cherbourg and Le Havre, and 30 airfields. The map also includes multiple seasons and more detail and accuracy than any previous DCS World map by utilizing new map technologies. The DCS: World War II Assets Pack provides numerous World War II air, land and sea assets to populate the Normand and other DCS World maps with. Eagle Dynamics has spent several years creating an entirely new set of combat vehicles to support DCS: World War II, and each unit is created with an exceptional level of detail and accuracy. We are happy to announce that the DCS: Normandy 1944 Map and DCS: World War II Assets Pack will be available as Early Access downloads on 26 May 2017. On Friday 26 May 2017, the pre-purchase bundle of 20% off the map and assets pack will end. Act now before it’s too late! In preparation for the release of the DCS: Normandy 1944 map, we are offering 30% off on all DCS World War II aircraft and DCS: Combined Arms. This sale starts today at 1500 GMT and will last until 29 May at 0900 GMT. Congratulations to the three winners of the Normandy Map lottery! We very much hope you enjoy your time over Normandy. We will send a private message to your Facebook pages with your keys following the release on 26 May 2017. Last edited by Groove; 05-19-2017 at 02:22 PM. Normandy 1944 map was created by UGRA-MEDIA company. Both the DCS: Normandy 1944 Map and the DCS: World War II Assets Pack are being released as Early Access products and will be continually updated until their final release status. Today we are releasing the first update to DCS World 2.1, which can include the DCS: Normandy 1944 Map and/or the DCS: NEVADA Test and Training Range Map. Over the past week, we have been carefully noting all feedback and we will do our best to address all concerns. For this first update, we have made the following primary changes. For following week, we plan to add several new DCS: World War II Assets Pack units including anti-aircraft units, beach fortifications, barrage balloons, and several others. In parallel to DCS World 2.1, we are also creating the next update for DCS World 1.5. The primary addition will be the support for the DCS: World War II Assets Pack. This update will be coming soon. With the Early Access, Alpha release of the DCS: Normandy 1944 Map and the DCS: World War II Assets Pack, the team is very focused on moving these projects from Alpha to Beta, and then Beta to Final release as soon as possible. Our teams devoted to these projects are working hard and making great progress. A big part of this effort is fleshing out the DCS: World War II Assets Pack. 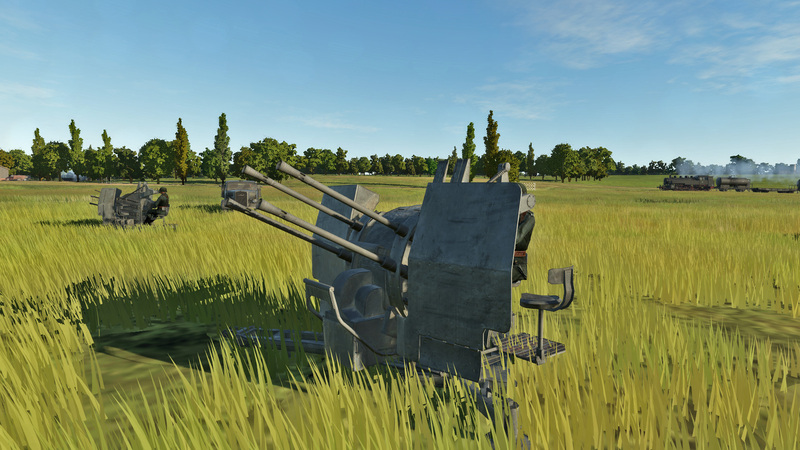 We have included some work-in-progress images of new Asset Pack units coming to DCS World: C-47, Ju-88, Sd.Kfz. 234/2 Puma, and Sd.Kfz.251. We are also continuing to develop the P-47 and Me 262, as part of the original Kickstarter plan. This is a huge year for DCS World War II that will continue to grow and improve as the year progresses. We have moved from tracking 30 damage variables to several hundred damage variables. This includes such variables as each airframe spars, engine components, fuel tanks, oil, hydraulic, and pneumatic systems, control surfaces, ammo boxes, etc. We have attached images to better illustrate how we will track internal damage to an aircraft. Last edited by Chizh; 06-02-2017 at 02:00 PM. Since the release of the hotfix last week, the team is very busy squashing bugs and adding new features to 2.1, the DCS: Normandy 1944 Map and the DCS: World War II Assets Pack. We plan to have the first, big, new update to all of these on 14 June 2017. A complete changelog will be provided at that time. For the ultimate World War II bundle deal we are offering a 60% off bundle deal that includes the DCS: Fw 190 D-9 Dora, DCS: Bf 109 K-4 Kurfurst, DCS: Spitfire LF Mk. IX, DCS: P-51D Mustang, and the P-51D: High Stakes Campaign. Find all of these great value bundle deals in the DCS e-shop from today at 1500 GMT and lasting until 19 June at 0900 GMT. A key aspect of recreating the air war over World War II Europe will be the creation of realistic bomber formations. Allowing mutually supportive defense in large formations has been an important new feature added to the Mission Editor. Let’s take a closer look at this new feature. For every formation, there needs to be a formation leader (these were often painted in high visibility colors) that all other flight elements fly in relation to. You will set the formation leader route and tasks as you normally would (a new “Carpet Bombing” has been added in which all members of the formation will drop bombs with the formation leader). In order to set the attached flight elements to the larger formation leader element, you will need to select the “WW2 Big Formation” task from Action list of the Perform Task, Advanced Waypoint Actions. You next need to set the Formation Leader by selecting the desired flight element clicking on it or with the “GROUP” drop down list (the formation leader element will then have a line connecting it with this following element). Leaders of "Groups" and "Wing" should follow the "main" leader and members of this "Groups" and "Wings" should follow their leaders. I.e. "Box" elements follow by their "Group" leaders, "Group" leaders follow by their "Wing" leaders and "Wing" leaders follow by main leader. Next thing you need to set - is flight element position in formation - for members of the "Box"- use "Pos_In_Box" drop down list, for "Box leaders"(members of Group) - use "Pos_In_Group" drop down list,and for "Group leaders"(members of Wing) - use "Pos_In_Wing" list. 1. Members of "Leading Box" has "New Airplane Group #001" as leader and their position determined by "Pos_In_Box" drop down list. 2. Leader of "Right Box" also has "New Airplane Group #001" as leader and their position determined by "Pos_In_Group" drop down list. 3. Member of "Right Box" has "New Airplane Group #010"(leader of this box) as leader and their position determined by "Pos_In_Box" drop down list. For best results, we suggest using the Close Formation in Options / Formation / WW2 Bomber Element / Close for Combat box formation, or Options / Formation / WW2 Bomber Element Height Separation/ Close for Javelin Down formation. Additionally, set the formation leader to a cruise speed (not maximum speed) to better allow attached elements to maintain formation and try to avoid drastic course changes in the flight plan. For the “Carpet Bombing” Task, you need to set it just to the formation leader and it allows you to set the bombing aim point, the quantity of bombs to be dropped and the length this bombs should cover. These settings will then be carried out by all attached formation elements. Last edited by Chizh; 06-09-2017 at 11:22 AM.